Parents will receive a courtesy email every Sunday morning reporting what they or their children have checked out. While there is no fine for overdue books, materials overdue by 30 days or more are assumed to be lost and a replacement fee will be assessed. If you feel our records are in error kindly email hsnively@mbusd.org. 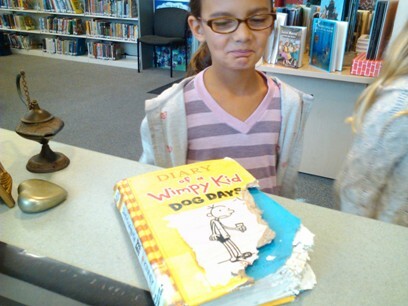 If a book is lost or damaged it must be paid for. Payment may be in the form of a check made out to MBUSD, or with exact cash (change cannot be made and will not be given). Send the payment to school marked Attention Library. Students who owe money to the Library will not receive their final report card. Payment is refundable if a lost book is found and returned on or before the last day of the current school year. Students visit the Library once a week with their class to listen to a story, practice library skills, and check out materials. In addition, students in grades 3-5 may visit the library every day during first recess to check out materials, get started on homework assignments, conduct research, play board games, draw, read, or relax with friends. Parents are encouraged to to open a Library account. Parents, please use the Library before or after school (see below) or during recess so as not to disturb a class visit. Students in grades 1-5 may visit the Library from 8-8:10am Monday through Friday to conduct Library business without a parent or caregiver. While Mrs. Snively does not provide after school supervision, all students are welcome to visit the Library in the company of a parent or caregiver at the following times: MON 2:15-3:30pm TUE 2:45-4:30pm THU 2:15-4:30pm FRI 2:45-4:30pm. The Library is not open after school on Wednesday. HOW MANY BOOKS? FOR HOW LONG? Students may borrow the number of books that equals their grade level. For example, 1st graders may borrow one book at a time and 5th graders may borrow five books at a time. TK and Kindergarten students borrow books when they visit with their class, but the books are kept in the classroom, not taken home. Adult patrons may borrow as may items as they wish to be responsible for. Library materials are due back in one week, or may be renewed if there are no hold requests.